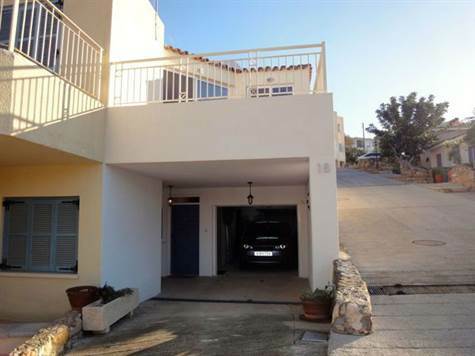 Chloraka Village, Paphos - This well presented 3 bedroom townhouse is located in the popular village of Chloraka, within walking distance to the beach, local shops & restaurants, and the local bus route running between Paphos and Coral Bay. From the front entrance stairs lead up to the first floor accommodation which has beautifully rustic solid wood flooring throughout. The spacious living room has an open fireplace for those chilly winter evenings and a decking area is easily accessible via large patio windows. The dining area also has patio windows making the living room a light and airy space. Here there is access to a second seating area and a pathway to the stunning swimming pool terrace which has lovely sea views. The galley style kitchen is well equipped with breakfast bar, fridge/freezer, built-in oven, gas hob and extractor fan and there is potential to extend this space if required. Through an archway off the living room is a hallway leading to two good size double bedrooms with fitted wardrobes and a separate shower room with vanity unit and heated towel rail. Access to the decking area is available from one of the bedrooms via patio windows. A huge third bedroom is located on the lower ground floor with archway to a walk- through closet and family size bathroom. A wonderful added bonus is the large garage with a workshop/utility area at the rear housing the washing machine and a small fridge. The garage door is automatically operated and there is further parking on the driveway. This impressive property is in excellent condition and has been well maintained by the current owners. Due to the number of extras included it is suitable both as a permanent residence, or as a holiday home. Full title deeds are available.